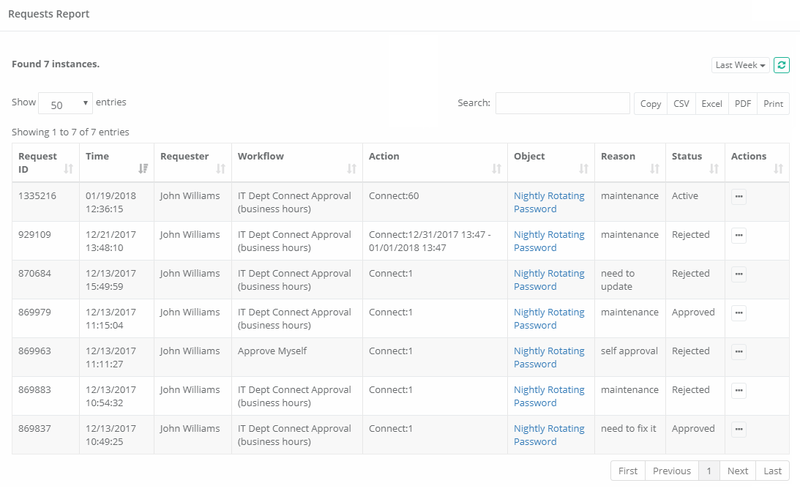 The Requests report provides a list of all Workflow Instances, including those that are active, approved and rejected. Filtering is available for a Time option. Search is available to quickly locate objects using string based queries. Export is available to export the available on-screen data to either a CSV or PDF file. Sorting is available by clicking on the desired column header. Request ID: Displays the unique ID of the request. Time: Displays the timestamp (MM/DD/YYYY HH:MM:SS) of when the request was submitted. Requester: Displays the name of the user that made the request or for which the request was made on-behalf of. Workflow: Displays the name of the workflow template that was used for this request. Action: Displays the action (i.e. Unlock or Connect) and time (minutes or range) of the request. Object: Displays the name and provides a link to the object that the request was made for. Reason: Displays the reason the user entered for submitting the request. Status: Displays the current status (Active, Approved or Rejected) of this request. Details: Displays the additional details of the request. Sessions: Displays any active or completed sessions associated with this request.